Objective: Familial pancreatic cancer (FPC) accounts for approximately 3% of all pancreatic cancer (PC) cases. It has been suggested that high-risk individuals (HRIs) should be offered a screening programme. Aim: To evaluate the diagnostic yield of a prospective screening programme in HRIs from families with FPC over a period of 5 years. Methods: HRIs of families with FPC of the National German Familial Pancreatic Cancer Registry (FaPaCa) were counselled and enrolled in a prospective, board-approved PC screening programme. Screening included clinical examination, laboratory tests, endoscopic ultrasound (EUS) and MRI with magnetic resonance cholangiopancreaticography (MRCP) and MR angiography. Results: Between June 2002 and December 2007, 76 HRIs of families with FPC took part in the screening programme with a total of 182 examination visits. Twenty-eight patients revealed abnormalities in EUS (n = 25) and/or MR/MRCP (n = 12). In 7 patients fine needle aspiration cytology was performed. Operative pancreatic explorations were performed in 7 individuals, resulting in limited resections in 6 cases. Histopathological examination of the resected specimens showed serous oligocystic adenomas (n = 3), pancreatic intraepithelial neoplasia 1 (PanIN1) lesions with lobular fibrosis (n = 1), PanIN2 lesions (n = 1) and PanIN1 lesion plus a gastric type intraductal papillary mucinous neoplasm (IPMN) (n = 1). Conclusions: In FPC an EUS/MR/MRCP-based screening programme leads to the detection of potential precursor lesions of PC. However, the yield of an extensive screening programme is low, especially since the tumourigenic value of low grade PanIN lesions is not yet defined. Taking into account the enormous psychological stress for the tested individual and the high costs, a general PC screening in HRIs is not justified. Pancreatic cancer (PC) still represents a challenging tumour entity with a dismal prognosis, having an overall 5-year-survival of <5%.1 This is mainly due to the fact that the tumour is characterised by late presentation, low resection rates and poor response to radiotherapy and chemotherapy. The few reported long-term survivors usually present with early stage tumours.2 A Japanese study revealed a 4-year survival rate of up to 78% after resection of PCs <2 cm. Almost half (42%) of the patients with these early stage cancers were asymptomatic.3 These results suggest that screening and early detection of pancreatic neoplasms may improve the outcome of PC. Although screening for PC and its precursors in the general population is not feasible due to the relatively low incidence of the disease and the lack of accurate diagnostic tests for early disease, it may have an impact on the outcome of the disease in populations at risk for PC such as patients with hereditary PC. An inherited predisposition to PC is currently believed to occur in three distinct clinical settings. First, it occurs in hereditary tumour predisposition syndromes that are defined primarily by a clinical phenotype other than PC, but are known to be associated with an increased risk of PC. These syndromes include Peutz–Jeghers syndrome (PJS), melanoma pancreatic–cancer syndrome (MPCS) or familial atypical multiple mole melanoma (FAMMM), hereditary breast and ovarian cancer, Li–Fraumeni syndrome and others. The second setting is hereditary pancreatitis and cystic fibrosis, in which genetically determined early changes of the pancreas can predispose to the development of PC. The third setting is familial pancreatic cancer (FPC) in which two or more first-degree relatives have PC without fulfilling the criteria of another inherited tumour syndrome. Only a few studies are currently available providing evidence that HRIs of families with FPC benefit from prospective screening for PC and its precursors.10 11 12 13 PC surveillance in families with FPC was first described by the University of Washington,10 11 using both endoscopic ultrasound (EUS) and endoscopic retrograde cholangiopancreaticography (ERCP). Twelve of 43 patients were noted to have abnormal findings on EUS and ERCP and underwent total pancreatectomy revealing widespread precancerous (PanIN) lesions, mostly PanIN2 in all specimens, but no evidence of PC. The Johns Hopkins group reported in two subsequent studies that screening based on EUS and CT diagnosed significant pancreatic and extrapancreatic neoplasms in asymptomatic HRIs.12 13 The authors also stated that IPMNs should be considered a part of the phenotype of FPC. A recent consensus conference14 proposed that screening of HRIs with a ⩾10-fold genetic risk for PC may be advocated in the context of peer-reviewed protocols with scientific evaluation and protection of human subjects. However, there is no level A evidence supporting these recommendations, and it was agreed that some centres would also perform screening on people with increased genetic risk, albeit <10 fold, such as those with only two first-degree relatives with PC. No consensus opinion could be reached on a specific approach for screening these HRIs for PC in view of the fact that all presently available imaging modalities and biomarkers such as carbohydate antigen (CA) 19-9 appear inadequate to detect early stage cancer. Here we report the results of a prospective screening study conducted by the National German Familial Pancreatic Cancer Registry (FaPaCa) on 76 asymptomatic HRIs of 34 FPC and MPCS kindreds over a period of 5 years between 2002 and 2007. The screening protocol included CA 19-9 serum values, EUS, EUS-guided fine needle aspiration cytology (EUS-FNAC) and for the first time MRI plus magnetic resonance cholangiopancreaticography (MRCP). HRIs were selected for PC screening if they provided informed consent to participate in the study, and had no personal history of PC. Screening started 10 years before the youngest age of onset in the family or by the age of 40 years, whichever occurred earlier. All HRIs had a baseline screening evaluation, which was repeated every 12 months. The baseline investigation of the HRIs, including genetic counselling, comprehensive family history, construction of the pedigree, etc., was performed as previously reported by our group.15 16 During a screening visit, HRIs underwent a physical examination, laboratory tests, EUS and an abdominal MRI combined with MRCP. In the case of abnormalities a control was scheduled after 6 weeks or EUS-FNAC was performed (fig 1). Screening algorithm in the National German Familial Pancreatic Cancer Registry (FaPaCa). CA, carbohydrate antigen; CEA, carcinoembryonic antigen; EUS, endoscopic ultrasound; FNAC, fine needle aspiration cytology; IOUS, intraoperative ultrasound; MRI+MRCP, MRI combined with magnetic resonance cholangiopancreaticography; PC, pancreatic cancer. EUS-FNAC was only done in patients with detectable solid or cystic lesions that could not be classified as a benign or malignant lesion by imaging, and in cases of diffuse parenchymal irregularities. EUS-FNAC was done using a 21 G EUS biopsy needle. Multiple passes (>10) of the needle were performed either through the singular lesion or through the areas with diffuse parenchymal irregularities. Cytology was evaluated by an experienced cytologist (Roland Moll). To classify chronic pancreatitis we used in this study the classification by Wiersema and colleagues (1993) using nine criteria, comprised of four parenchymal (CP1–CP4) and five ductal criteria (table 1).19 20 When using the nine original criteria a minimum of 3/9 have to be present to allow the diagnosis of chronic pancreatitis confirmed by ERCP. However, for a reliable EUS diagnosis of chronic pancreatitis usually 5 of 9 criteria should be present.19 The relevance of the presence of 2–5 EUS criteria of chronic pancreatitis in the absence of other clinical or imaging signs of the disease is uncertain. MRI was performed using a 1.5 Tesla clinical MR scanner (Magnetom Sonata, Siemens, Erlangen, Germany) in two sessions on two consecutive days. First, axial T2-weighted as well as T1-weighted images with and without contrast agent (Magnevist, Bayer Schering Pharma, Berlin, Germany) were acquired. During contrast agent administration dynamic contrast-enhanced MR images (DCE MRI) were acquired to visualise pancreas perfusion. In addition, MRCP images were acquired prior to and after stimulation with secretin (Secrelux, Sanochemia, Neuss, Germany). On the second day, axial and coronal T1-weighted, fat-saturated images were acquired prior to and after application of a pancreas-specific contrast agent (Teslascan, GE, Oslo, Norway). Two experienced radiologists without knowledge of any clinical or other imaging results independently reviewed all MRIs. Images were analysed for focal lesions in the morphological T1- and T2-weighted images. In addition, perfusion abnormalities were analysed in the DCE MRI perfusion images where pancreatic carcinomas were sought to have a lower perfusion than healthy pancreatic tissue. The MRCP images were evaluated for filling defects, stenoses or duct interruption. Teslascan-enhanced images were also evaluated for focal hypoenhancement in comparison with healthy pancreatic parenchyma. Lesions were classified as solid or cystic. They were measured in two dimensions and described according to shape, heterogeneity and location. The algorithm for follow-up and treatment is summarised in fig 1 and was agreed upon by an expert panel composed of pathologists, surgeons, gastroenterologists, oncologists, radiologists, geneticists and biostaticians of multiple centres contributing to FaPaCa prior to the start of the prospective screening study. In cases where the diagnostic investigation was uneventful during the baseline examination a follow-up examination as described above was repeated after 12 months. In the event of a pathological finding in the pancreas by any of the imaging modalities, the findings were reviewed by an interdisciplinary board consisting of geneticists, psycho-oncologists, surgeons and gastroenterologists at the Philipps-University of Marburg. significant change in size and morphology during follow-up. HRIs with lesions potentially suggestive for malignancy not fulfilling the above mentioned criteria were subjected to EUS-FNAC of the detected lesions. After the board’s review, the HRI was recommended either surgery if the sum of pathological findings made the lesion highly suspicious for malignancy or to enter a close follow-up track in all other cases. Patients entering the close follow-up were recommended to receive a control evaluation by EUS and MRI+MRCP after 12 weeks. In the case of lesion stability a further re-evaluation was recommended after 6 months and thereafter every 12 months. HRIs to whom surgery was proposed based on imaging findings were counselled by an interdisciplinary board consisting of a geneticist, surgeon and gastroenterologist regarding the pro and cons of surgical therapy versus the alternative option of close follow-up and repeat imaging. HRIs who agreed to the surgical approach were then scheduled for pancreatic exploration and eventually limited pancreatic resection (either pylorus-sparing partial duodenopancreatectomy or distal pancreatectomy), depending on the distribution of lesions in preoperative imaging. Intraoperative ultrasound (IOUS) was routinely used to confirm the preoperatively identified lesions and eventually to identify additional pathologies. After limited pancreatic resection the specimen was sent intraoperatively for frozen section. For those cases with the diagnosis of a high grade PanIN or a PC based on frozen section it was planned to extend the procedure to total pancreatectomy (see fig 1). A total of 527 members of 110 families with FPC were counselled by a genetic counsellor (MS) and participation in the PC screening programme was recommended to 205 HRIs by an interdisciplinary board consisting of a geneticist, psychologist, surgeon and gastroenterologist. Eighty (39.5%) HRIs (including two BRCA2 mutation carriers) of 28 families with FPC and 6 families with MPCS decided to take part in the screening programme. A typical pedigree of a family with FPC is shown in fig 2A. The characteristics of families and HRIs are summarised in table 2. Data presented in this report are based on the screening of 76 HRIs, since 4 HRIs decided to have the screening evaluations done in different hospitals closer to their home towns. High-risk individual (HRI) 25-1-91-1. 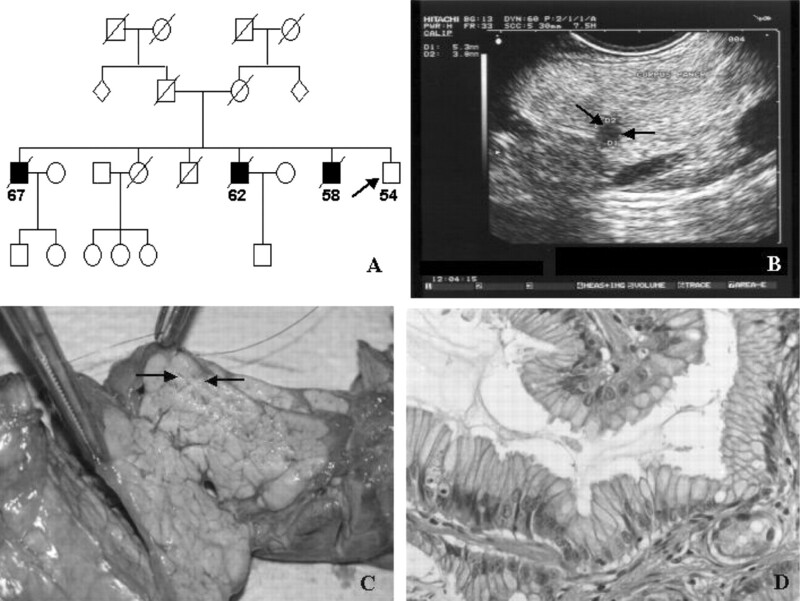 (A) Familial pancreatic cancer (FPC) pedigree with three pancreatic cancer-affected brothers; HRI (arrow). (B) Endoscopic ultrasound: hypoechoic mass (arrows). (C) Intraoperative finding with fibrotic appearing area (arrows) beside normal appearing pancreatic tissue. (D) Pathology slide: intraepithelial neoplasia 1 (PanIN1) with lobular fibrosis. Of the 76 HRIs, 32 (42%) belonged to families with FPC with ⩾3 first-degree relatives with PC. Two HRIs were BRCA2 mutation carriers from families with FPC or MPCS with two first-degree relatives (high risk, >10 fold). Forty-four (58%) of the HRIs belonged to families with FPC with two first-degree relatives with PC without any of the tested mutations (moderate risk, 5- to 10-fold). A total of 182 visits were conducted in the 76 HRIs between June 2002 and December 2007. HRIs underwent between one and seven examination visits (median two examination visits). None of the HRIs revealed any pathological finding related to pancreatic disorders or melanoma during the physical examination. All except two HRIs showed normal laboratory investigations. In one case serum levels of CA 19-9 were elevated at three visits, with a maximum of 98 kU/ml, ranging from 56 to 98 kU/ml (upper limit: 35 kU/ml). This HRI was a 56-year old female with no history of chronic pancreatitis or diabetes mellitus. She had two first-degree relatives with PC and was a non-smoker. Imaging did not show any abnormality of the pancreas. Upper gastrointestinal tract endoscopy as well as evaluation by the gynaecologist was normal. The cause of the CA 19-9 elevation remained unclear. The patient has not developed a pancreatic lesion during the complete follow-up period of 28 months. A 56-year-old HRI had a serum lipase value elevated three times over the upper limit at one visit which was not associated with abdominal complaints. This HRI had no history of chronic pancreatitis but reported one first-degree relative with PC and another with malignant melanoma. Imagings showed no pancreatic abnormality at any time during screening. A total of 167 EUS examinations were performed in the 76 HRIs. EUS revealed suspicious pancreatic and peripancreatic lesions in 25 of 76 (33%) individuals, which have been summarised in table 3. Seventeen of the 25 (68%) HRIs with EUS abnormalities revealed ⩾3 EUS signs associated with chronic pancreatitis according to the classification of Wiersema and colleagues.19 Eight HRIs had ⩾5 signs usually associated with a high diagnostic probability for chronic pancreatitis. Interestingly, signs of chronic pancreatitis were found in the pancreatic tail in all of the 17 patients, and were present only in this area in 9/17 cases. Only one of these HRIs also showed ductal alterations typical of chronic pancreatitis in MRT-MRCP. In three HRIs hypoechoic lesions were identified within the diffuse changes, and in another case an extrapancreatic nodule was additionally seen. None of the HRIs had any clinical signs of chronic pancreatitis. In total 22.4% (17 of 76 HRI) showed EUS signs of chronic pancreatitis. A total of 10 HRIs showed solitary pancreatic lesions. Solitary hypoechoic (5) or heterogenous (1) masses with a median diameter of 6 mm (range 4–14 mm) were evident in six cases (fig 2B), macrocystic (>1 cm) lesions in two and small cystic lesions and a retropancreatic nodule in one proband each, respectively (table 3). In two HRIs the cystic lesion had a small solid component of 5–9 mm. Seven of these lesions could be confirmed on MRI. Six lesions were classified as suspicious at the initial diagnosis following the criteria outlined in the Subjects and methods section and one lesion showed progression during follow-up, so that surgical exploration was suggested without further FNAC. A total of 329 MRI investigations were performed on the 76 HRIs. MRI showed abnormalities of the pancreas in 18 individuals (23.3%). However, in six individuals the potential pathological MRI findings were not reproducible in follow-up investigations and therefore not classified as suspicious lesions. In the remaining 12 HRIs, MRI showed the following pathologies in the pancreas: hypointense masses in six individuals, microcystic (<10 mm) lesions and macrocystic lesions in two individuals each and duct irregularities corresponding to mild chronic pancreatitis in one HRI. In another HRI there were two solid liver lesions. In one of these 12 HRIs EUS was normal, whereas parallel EUS was not done in two HRIs for technical reasons. EUS-FNAC was performed in 7 HRIs. Diffuse changes of the pancreatic tail led to the decision in 3 cases. Cytology revealed normal exocrine pancreatic tissue without any signs of dysplasia or inflammation and therefore resulted in continued follow-up. In one of the three cases an extrapancreatic nodule was aditionally evaluated by FNAC and resulted in normal lymphatic tisuue. In 4 cases FNAC was performed for singular lesions, which presented as hypoechoic (3) nodules within diffuse changes and as an inhomogenous (1) mass within an otherwise normal appearing pancreas. Cytology revealed normal pancreatic tissue. Adverse events of FNAC, such as bleeding or pain, did not occur. Pathological findings of EUS and MRI in HRIs are summarised in table 3. 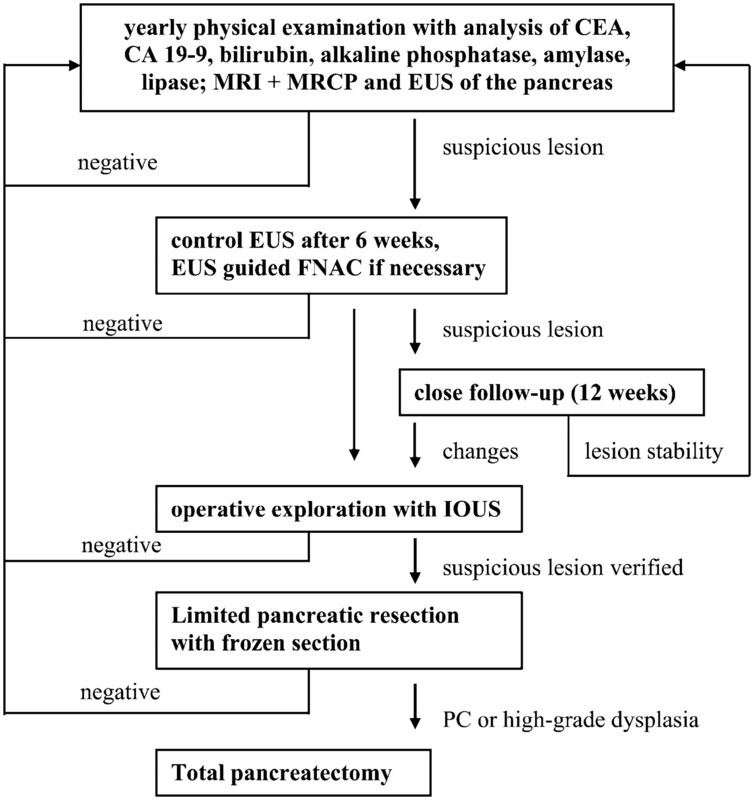 Surgical explorations of the pancreas were performed in seven individuals, whereas the other HRIs with imageable pancreatic singular lesions or diffuse parenchymal irregularities in EUS are still under close surveillance. The 7 HRIs that underwent surgery had suspicious pancreatic lesions such as hypoechoic masses (5 HRIs; fig 2A,B) and macrocystic lesions with solid parts (2 HRIs). Complete pancreas exploration with bidigital palpation of the gland and IOUS was routinely performed. Six individuals underwent limited pancreatic resections, since IOUS was able to identify the preoperatively imaged pancreatic lesion. Due to the localisation of the lesions, distal pancreatectomy with (3 HRIs) or without (3 HRIs) splenectomy was performed. Frozen section always revealed benign pathology with or without low grade PanIN, so that we did not proceed to total pancreatectomy in any of the cases. In one proband the preoperatively imaged hypoechogenic lesion of the pancreatic head could not be verified during pancreatic exploration, so that no pancreatic resection was performed. However, since this patient had demonstrated a liver nodule during the screening examination a wedge resection of the liver was performed. In none of the 7 cases was any additional lesion identified during exploration. The macroscopic aspect of the 7 explored pancreatic glands was completely normal, except for the focal abnormalities seen on preoperative imaging procedures (fig 2C). Typical macroscopic changes usually present in advanced chronic pancreatitis were not evident in any of the cases by visual and manual examination and by IOUS. After surgery, no major complications occurred. Mean hospital stay was 15.3 days (range 10–23). Two individuals developed low output pancreatic fistulas that could be managed conservatively. After a median follow-up of 44 (5–93) months postsurgery none of the patients has developed insulin-dependent diabetes mellitus or other imageable pancreatic lesions. Histopathological examination of the resected specimens revealed lobular/focal fibrosis in 4 of 6 specimens. In addition to lobular fibrosis the following pancreatic pathologies were found: only PanIN1 (n = 1), PanIN2 (n = 1), PanIN1 and squamous metaplasia (n = 1), PanIN1combined with a serous oligocystic adenoma (SOIA) (n = 1), and PanIN1 and a gastric type IPMN. In addition, two cases of SOIA without evidence of fibrosis were found. In one HRI no pancreatic tumour could be verified during exploration, and wedge resection of a preoperatively detected focal liver lesion was diagnosed as focal nodular hyperplasia of the liver. The characteristics of the HRIs who underwent surgery, including complications, pathology results and follow-up, are summarised in table 4. In summary, none of the focal pancreatic lesions detected during screening of HRIs was verified as pancreatic cancer. Six of 7 HRIs receiving limited pancreatic resection had either low PanINs 1 or 2, SOIA or IMPN. Two additional HRIs with cystic lesions in the pancreas showed criteria suggestive of IPMN in the most recent imaging results (table 2). Following the recommendations for handling IPMNs,22 23 one patient with main duct IPMN will be recommended surgery, while one with side branch IPMN will be recommended close follow-up. Since solitary SOIAs are not considered to progress to cancer, and the tumourigenic value of PanIN1/2 lesions remains uncertain, the diagnostic yield of potentially relevant pancreatic lesions is 1 IPMN in 76 screened cases and thus corresponds to 1.3%. One of the major challenges for PC screening approaches is the definition of high-risk groups to be recruited for targeted screening. There is no rationale for population-based PC screening strategies at present, owing to the relatively low incidence of PC, the limitations of imaging, the lack of reliable tumour markers and the unavailability of any studies demonstrating survival benefits for such screening.1 24 However, according to a recent consensus conference of experts it is considered appropriate to perform PC screening under research protocol conditions for those individuals who are deemed at high risk for developing PC.14 First-degree relatives of patients with PC of FPC or MPCS kindreds as in our study cohort are considered HRIs, since they carry a moderate to high risk of developing PC. This prospective, controlled single institution study yielded a low prevalence of potentially significant pancreatic pathologies. Six HRIs screened had either pathologically confirmed neoplasms (3 SOIA and 1 IPMN) and/or low (3 HRIs) to moderate (1 HRI) PanIN lesions. All diagnosed PanIN lesions were of low or intermediate grade that are thought to have a low risk of progressing to cancer.24 Since two HRIs only had SOIA, which is not considered a precancerous lesion, the diagnostic yield for significant precursor lesions was 0.76% (1 of 76 HRIs). Evidence that these lesions progress to PC is only available for IPMNs, and has not been proven for PanIN1 and 2 lesions. So far only in 1 out of 76 screened patients has pancreatic resection most probably prevented development of PC. The results of our study are disappointing compared with the data presented by the Johns Hopkins group. Canto et al12 reported in their initial study on 38 HRIs of FPC kindreds with >3 affected members that the prevalence of clinically significant pancreatic neoplasms was 5.3% (2 of 38 HRIs). In a recent prospective study, the same group reported pancreatic neoplasias or PanIN lesions in 8 of 78 (10%) HRIs from FPC or PJS kindreds. Differences exist regarding the composition of HRIs between this and our study, since we did not include PJS patients and the fraction of HRIs with high risk in the study of Canto et al13 was 55% compared with 42% in our study. Therefore, we cannot exclude that this may in part be the reason for the lower yield of preneoplastic lesions in our study population. Nevertheless, interpretation of the existing studies with a relatively low diagnostic yield makes the effectiveness of screening for pancreatic neoplasia highly questionable, when compared with other commonly used cancer screening strategies such as mammography for breast cancer.25 This holds especially true in light of a recent study by Rubenstein and colleagues on PC screening, which hypothesised that a “doing nothing” strategy provides the lowest costs and the greatest remaining quality-adjusted life years.26 Thus, future research studies should broaden the criteria for screening and critically evaluate which high-risk groups would benefit from PC screening. Based on currently available data, PC screening of HRIs is only justified in board-approved, prospective controlled studies. No consensus opinion exists on a specific approach for PC screening in HRIs. Many centres presently use an EUS-based approach based on its ability to detect pancreatic masses <1 cm in size in the absence of chronic inflammation of the gland.13 Other centres have used CT scans and/or ERCP as major tools for PC screening.10 11 Our study is the first to investigate a large group of 76 HRIs with >300 MRI examinations. We decided to use MRI combined with secretin-enhanced MRCP, since ERCP as an invasive diagnostic tool has a significant risk of post-ERCP pancreatitis of up to 8% in prospective trials.27 In addition, MR/MRCP, in the same way as ERCP, has been suggested to diagnose morphological changes of chronic pancreatitis.28 29 30 31 As long as no reliable diagnostic markers for pancreatic juice are available, screening of asymptomatic HRIs with ERCP is not justified. For the above-mentioned reasons other groups also changed their screening strategy and eliminated ERCP from their screening algorithm.13 In our study, small pancreatic lesions were readily visualised by EUS, but not consistently detected by MRI. Four of seven lesions that were imaged by EUS and led to surgical exploration were also detected by MRI scanning. Thus, our MRI data are comparable with the results obtained by other groups using CT scanning.10 12 13 However, MRI does not expose the HRI to a repeated radiation load and might therefore be the superior imaging tool in the setting of PC screening. Both MRI and CT can detect extrapancreatic lesions. Since it is acknowledged that some HRIs are also at risk for a variety of extrabdominal malignancies, combination of EUS with an imaging modality such as MRI or CT appears mandatory. The studies of the Johns Hopkins group12 13 found chronic pancreatitis-like changes according to the classification of Sahai et al in 45% and 61% of the examined HRIs.32 These abnormalities, predominantly evident in EUS, were significantly more common and more severe in the HRIs, compared with control subjects, regardless of age and alcohol exposure. EUS signs of chronic pancreatitis in HRIs of FPC kindreds were also described by the University of Washington in Seattle group.10 11 These authors suggested that the pancreatitis-like changes (lobulation, echogenic foci, strands and sacculation of ducts) are also part of the phenotype of their FPC kindreds. They also suggested that these changes are associated with pancreatic dysplasia or PanIN but not chronic pancreatitis.10 In the present study the prevalence of pancreatitis-like changes detected by EUS in HRIs was, at 22.4% (17 of 76 HRIs), lower than in the above-mentioned studies. It is also of note that the pancreatitis-like changes were predominantly located in the pancreatic tail, and all but one HRI had normal MRI investigations, including secretin-enhanced MRCP, with no heterogeneity or duct sacculations. The clinical significance of these changes in HRIs of families with FPC remains unclear. It may be speculated that these diffuse changes of the pancreatic ducts and parenchyma are indicative of an early stage of the FPC, which warrants further investigation. As a result of their recent screening study, Canto et al13 suggested that IPMN should be considered a part of the phenotype of FPC, since pathological examination revealed IPMNs in 6 of 8 HRIs who underwent surgery. However, in their initial study,12 only one IPMN was diagnosed in six surgically treated HRIs. In the present study a gastric-type IPMN was found in 1 of 6 specimens. Two additional HRIs in our prospective screening studies displayed cystic pancreatic lesions in imaging analyses compatible with IPMN and are under close surveillance (see table 2). A previous genetic study has shown that familial and sporadic forms of PC and IPMNs share distinct genetic changes such as loss of heterozygosity on chromosome 19p.33 However, given the small number of patients analysed to date, the association of IPMN and FPC remains to be established. Interestingly, 3 of 6 HRIs receiving limited pancreatic resections had histologically proven SOIA corresponding to 4% (3/76) of HRIs, which is in line with the 5.2% reported by Canto and co-workers.13 Although these benign tumours have rarely been reported to progress to PC, they appear to be more frequent in FPC than in the general population and may thus belong to the phenotype of the FPC syndrome. Screening programmes should also address the issue of what to do when lesions are detected by screening tests. Ideally, screening strategies should be accompanied by effective preventive or treatment options that lead to a significant survival benefit. At present, surgery is the main treatment modality for pancreatic neoplasms. The appropriate timing of surgical intervention for asymptomatic pancreatic neoplasms detected by screening is uncertain. At the beginning of our study we had a relatively aggressive attitude towards surgery, since HRIs with reproducible, even very small lesions were advised to undergo surgical exploration. In view of the low diagnostic yield of our screening strategy, the aggressive surgical approach was abandoned in favour of close surveillance and repeated imaging. For this reason we currently have 21 HRIs with imageable lesions under close surveillance and not scheduled for exploration. In FPC an EUS-based screening programme leads to the detection of potential precursor lesions (PanIN, IPMN) of PC. However, the yield of an extensive screening programme is much lower than expected, especially since the tumourigenic value of low grade PanIN lesions is yet not defined. Distinguishing neoplastic from non-neoplastic pancreatic lesions remains a challenge. EUS can visualise these early lesions, but false-positive results occur. MRI with MRCP is a useful complementary imaging tool for PC screening. Chronic pancreatitis-like changes might be less frequently prevalent in HRIs of FPC families than previously reported, but may be indicative of an early stage of the familial pancreatic disease. IPMN and SOIA might be part of the phenotype of the FPC syndrome. PC screening should only be performed in the setting of board-approved, prospective controlled long-term studies with a scientific evaluation to validate the safety and diagnostic accuracy of the screening strategy. In the future we will hopefully establish reliable biomarkers in the pancreatic juice or blood to provide a non-invasive, accurate and cost-effective method for the detection of early pancreatic neoplasia in HRIs. We thank all of the HRIs participating in our study. For evaluation of the pathology slides we are grateful to Professor R Moll, Department of Pathology, Philipps-University-Hospital Marburg and to Professor G Kloeppel, Institute for General Pathology, University-Hospital Schleswig-Holstein, Campus Kiel.
. Pancreatic cancer: the bigger picture. Surg Clin North Am 2001;81:557–74.
. Prognostic factors in resected pancreatic adenocarcinoma: analysis of actual 5-year survivors. J Am Coll Surg 2004;198:722–31.
. Clinicopathologic features of small pancreatic adenocarcinoma: a collective study. Cancer 1996;78:986–90.
. Increased risk of incident pancreatic cancer among first-degree relatives of patients with familial pancreatic cancer. Clin Cancer Res 2001;7:738–44.
. Risk factors for the development of pancreatic cancer in familial pancreatic cancer kindreds. Gastroenterology 2003;124:1292–9.
. Reported family aggregation of pancreatic cancer within a population-based case–control study in the Francophone community in Montreal, Canada. Int J Pancreatol 1991;10:183–96.
. Cancer as a complex phenotype: pattern of cancer distribution within and beyond the nuclear family. PLoS Med 2004;1:e65.
. Precursors to pancreatic cancer. Gastroenterol Clin North Am 2007;36:831–49.
. Screening and surveillance for hereditary pancreatic cancer. Gastrointest Endosc 2002;56:S82–6.
. Screening for early pancreatic neoplasia in high-risk individuals: a prospective controlled study. Clin Gastroenterol Hepatol 2006;4:766–81.
. German national case collection of familial pancreatic cancer—clinical–genetic analysis of the first 21 families. Onkologie 2002;25:262–6.
. Familial pancreatic cancer (part 1): genetic pathology review. Nebr Med J 1989;74:109–12.
. Preoperative diagnosis of insulinoma: low body mass index, young age, and female gender are associated with negative imaging by endoscopic ultrasound. Eur J Endocrinol 2007;157:209–13.
. Prospective evaluation of endoscopic ultrasonography and endoscopic retrograde cholangiopancreatography in patients with chronic abdominal pain of suspected pancreatic origin. Endoscopy 1993;25:555–64.
. Endoscopic ultrasound in chronic pancreatitis. Z Gastroenterol 2005;43:737–49.
. Pancreatic fibrosis associated with age and ductal papillary hyperplasia. Virchows Arch 2005;447:800–5.
. Pancreatic intraepithelial neoplasia: a new nomenclature and classification system for pancreatic duct lesions. Am J Surg Pathol 2001;25:579–96.
. Intraductal papillary mucinous neoplasms of the pancreas: an updated experience. Ann Surg 2004;239:788–97. American Gastroenterological Association. Medical Position Statement: epidemiology, diagnosis, and treatment of pancreatic ductal adenocarcinoma Gastroenterology 1999;117:1463–84.
. Screening mammography in community practice: positive predictive value of abnormal findings and yield of follow-up diagnostic procedures. Am J Roentgenol 1995;165:1372–7.
. A clinical and economic evaluation of endoscopic ultrasound for patients at risk for familial pancreatic adenocarcinoma. Pancreatology 2007;7:514–25.
. Role of endoscopic retrograde cholangiopancreatography in acute pancreatitis. World J Gastroenterol 2007;13:6314–20.
. Magnetic resonance imaging for diagnosing chronic pancreatitis. J Gastroenterol 2007;42:108–12.
. Accuracy of endoscopic ultrasonography and magnetic resonance cholangiopancreatography for the diagnosis of chronic pancreatitis: a prospective comparison study. J Clin Gastroenterol 2007;41:88–93.
. Secretin-enhanced magnetic resonance cholangiopancreaticography: value for the diagnosis of chronic pancreatitis. Rofo 2007;179:790–5.
. Risk factors for post-ERCP pancreatitis: a prospective, multicenter study. Gastrointest Endosc 2001;54:425–34.
. Prospective assessment of the ability of endoscopic ultrasound to diagnose, exclude, or establish the severity of chronic pancreatitis found by endoscopic retrograde cholangiopancreatography. Gastrointest Endosc 1998;48:18–25.
. Genome-wide allelotypes of familial pancreatic adenocarcinomas and familial and sporadic intraductal papillary mucinous neoplasms. Clin Cancer Res 2007;13:6019–25. Funding This work was supported by a grant from the Deutsche Krebshilfe (Grant No 106 925). Ethics approval The FaPaCa registry and the prospective screening study were approved by the Ethics Committee of the Philipps-University of Marburg (36/1997, last amendment 2003). Screening for familial pancreatic cancer: is doing something better than doing nothing?